Whether you’re giving a business presentation or celebrating a marriage, our private dining room is the ideal setting for any event. The room can be completely enclosed for privacy and can seat up to 35 guests for dinner or 45 for a cocktail party. Our seasonal family-style menus are ideal for large groups, creating a unique communal-style dining experience. In addition to the enclosed Private Dining Room, we have an adjacent space that looks out on the rest of the restaurant. This space is known as the Mezzanine and is ideal for cocktail parties or events that call for a livelier atmosphere. The entire upstairs of our restaurant can be reserved for groups between 40 and 65 guests. Restaurant "buy-outs” are also an option for larger groups. We have a microphone, screen and LCD projector available for rent for presentations and slideshows. 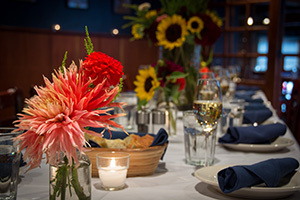 email events@900wall.com or call 541.323.6295 to speak with a 900 Wall Special Events Coordinator, for more information on booking a private event. what do our clients say about private dining at 900 Wall?